Jahan F, Nanji K, Qidwai W, Qasim R. Fibromyalgia Syndrome: An Overview of Pathophysiology, Diagnosis and Management. Oman Med J 2012 May; 27(3):192-195. Clinicians should be familiar with the signs and symptoms of fibromyalgia and diagnose the condition with minimum investigation.12 Since the symptoms of fibromyalgia wax and wane related to stresses,13 treatment (as with that of other chronic diseases) is an ongoing process rather than management of a single episode. In terms of conditions associated with fibromyalgia; there are certain conditions associated with fibromyalgia. Although fibromyalgia is the most common chronic widespread pain condition, it is often under diagnosed. The diagnosis of fibromyalgia has been shown to increase patient satisfaction and reduce healthcare utilization. • History of widespread pain has been present for at least three months. • Pain in 11 of 18 tender point sites on digital palpation (both side of the body): Occiput (2),Low cervical (2),Trapezius (2), Supraspinatus (2), Second rib (2), Lateral epicondyle (2), Gluteal (2), Greater trochanter (2), Knee (2). 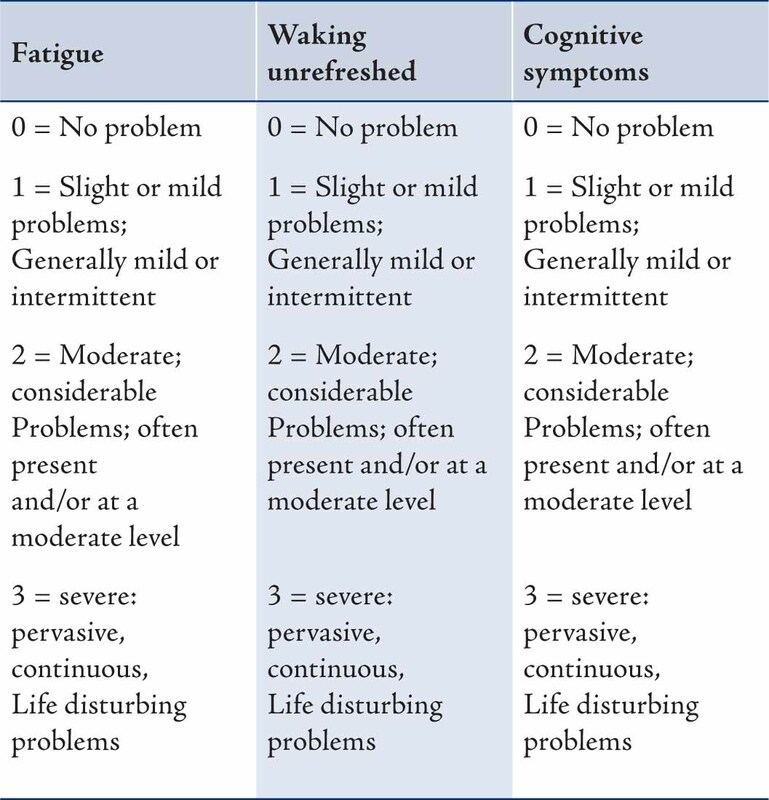 Recently, ACR is proposing a new set of diagnostic criteria for fibromyalgia that includes common symptoms such as fatigue, sleep disturbances, and cognitive problems, as well as pain (Table 2). The tender point test is being replaced with a widespread pain index and a symptom severity (SS) score. The new criteria appear in a one-page symptom checklist format that will hopefully be more suitable for use in the primary-care setting.23 A tender point evaluation is no longer required although a full physical exam is still recommended along with other diagnostic tests to identify causes for the patients' symptoms besides fibromyalgia. In place of the tender point count, patients (or their physician) may endorse 19 body regions in which pain has been experienced during the past week. One point is given for each area, so the score is between 0-19. This number is referred to as the Widespread Pain Index (WPI) and it is one of the two required scores needed for a doctor to make a diagnosis of fibromyalgia. The second part of the score required to assess the diagnosis of fibromyalgia involves the evaluation of a person's symptoms. The patient ranks specific symptoms on a scale of 0-3. These symptoms include: Fatigue, Waking unrefreshed, Cognitive symptoms, Somatic (physical) symptoms in general (such as headache, weakness, bowel problems, nausea, dizziness, numbness/tingling, hair loss). The numbers assigned to each are added up, for a total of 0-12. • WPI of 3-6 and SS scale score of at least 9. Table 2: New ACR Diagnostic Criteria. Laboratory testing, such as complete blood count, erythrocyte sedimentation rate, rheumatoid factor, antinuclear antibody, thyroid-stimulating hormone, T3, T4, creatinine phosphokinase, a serum muscle enzyme, vitamin D, ESR, CRP, renal function, and liver function tests are necessary to rule out other disorders. X-rays, blood tests, specialized scans such as nuclear medicine and CT scan muscle biopsy are normal in cases of fibromyalgia. A great majority of FMS patients can be managed well by Family Physicians in ambulatory care by managing stress, depression, pain and life style modification.28 CNS agents, antidepressants, muscle relaxants, or anticonvulsants are the most successful pharmacotherapies. There are different pain medications which are useful in the management of FMS. Paracetamol, NSAIDs have been used but pain usually do not respond to them. Acetaminophen may ease the pain and stiffness caused by fibromyalgia. Besides analgesics, there are drugs used like antidepressant, anti convulsant, Dopamine agonist and Growth hormone. Fibromyalgia is a common rheumatologic syndrome characterized by heightened pain sensitivity, fatigue, sleep disturbance, and other symptoms as a result of dysregulation of neurophysiologic function. Many theories of etiology are under investigation. With the proper treatment coupled with a caring and well informed physician; patients with fibromyalgia should be able to improve function and reduce pain. A variety of neuro-modulatory agents are showing capability of beneficially affecting the symptom domains of patients with fibromyalgia. Treatment options currently exist to assist patients in relieving symptoms and preventing flare-ups. Prompt diagnosis and treatment of fibromyalgia patients may produce substantial improvement in quality of life. The authors declare no conflict of interest and no funding was received for this work. All authors have contributed in conceptualization, and were involved in drafting the manuscript, critically revising it for important intellectual content and have given final approval of the version to be published. 1. Blyth FM. Chronic pain–is it a public health problem? Pain 2008 Jul;137(3):465-466. PubMed doi:10.1016/j.pain.2008.04.013. 2. Mease PJ, Clauw DJ, Arnold LM, Goldenberg DL, Witter J, Williams DA, et al. Fibromyalgia syndrome. J Rheumatol 2005 Nov;32(11):2270-2277. 3. Shleyfer E, Jotkowitz A, Karmon A, Nevzorov R, Cohen H, Buskila D. Accuracy of the diagnosis of fibromyalgia by family physicians: is the pendulum shifting? J Rheumatol 2009 Jan;36(1):170-173. 4. Mease P, Arnold LM, Bennett R, Boonen A, Buskila D, Carville S, et al. Fibromyalgia syndrome. J Rheumatol 2007 Jun;34(6):1415-1425. 5. Schmidt-Wilcke T, Clauw DJ. Fibromyalgia: from pathophysiology to therapy. Nat Rev Rheumatol 2011 Sep;7(9):518-527. 6. Perrot S. Fibromyalgia syndrome: a relevant recent construction of an ancient condition? Curr Opin Support Palliat Care 2008 Jun;2(2):122-127. 7. Culpepper L. Evaluating the patient with fibromyalgia. J Clin Psychiatry 2010 Sep;71(9):e25. 8. Gerdle B, Björk J, Cöster L, Henriksson KG, Henriksson C, Bengtsson A. Prevalence of widespread pain and associations with work status: a population study. BMC Musculoskelet Disord 2008;9:102. 9. Wolfe F, Ross K, Anderson J, Russell IJ, Hebert L. The prevalence and characteristics of fibromyalgia in the general population. Arthritis Rheum 1995 Jan;38(1):19-28. 10. White KP, Harth M. Classification, epidemiology, and natural history of fibromyalgia. Curr Pain Headache Rep 2001 Aug;5(4):320-329. 11. Assumpção A, Cavalcante AB, Capela CE, Sauer JF, Chalot SD, Pereira CA, et al. Prevalence of fibromyalgia in a low socioeconomic status population. BMC Musculoskelet Disord 2009;10:64. 12. Bartels EM, Dreyer L, Jacobsen S, Jespersen A, Bliddal H, Danneskiold-Samsøe B. Fibromyalgia, diagnosis and prevalence. Are gender differences explainable? Ugeskr Laeger 2009 Nov;171(49):3588-3592. 13. Winfield JB. Psychological determinants of fibromyalgia and related syndromes. Curr Rev Pain 2000;4(4):276-286. 14. Arnold LM, Hudson JI, Keck PE, Auchenbach MB, Javaras KN, Hess EV. Comorbidity of fibromyalgia and psychiatric disorders. J Clin Psychiatry 2006 Aug;67(8):1219-1225. 15. Staud R. Is it all central sensitization? Role of peripheral tissue nociception in chronic musculoskeletal pain. Curr Rheumatol Rep 2010 Dec;12(6):448-454. 16. Yunus MB. Role of central sensitization in symptoms beyond muscle pain, and the evaluation of a patient with widespread pain. Best Pract Res Clin Rheumatol 2007 Jun;21(3):481-497. 17. Tanriverdi F, Karaca Z, Unluhizarci K, Kelestimur F. The hypothalamo-pituitary-adrenal axis in chronic fatigue syndrome and fibromyalgia syndrome. Stress 2007 Mar;10(1):13-25. 18. Bradley LA. Psychiatric comorbidity in fibromyalgia. Curr Pain Headache Rep 2005 Apr;9(2):79-86. 19. Woolf AD. The bone and joint decade 2000-2010. Ann Rheum Dis 2000 Feb;59(2):81-82. 20. Katz RS, Wolfe F, Michaud K. Fibromyalgia diagnosis: a comparison of clinical, survey, and American College of Rheumatology criteria. Arthritis Rheum 2006 Jan;54(1):169-176. 21. Wolfe F, Smythe HA, Yunus MB, Bennett RM, Bombardier C, Goldenberg DL, et al; Report of the Multicenter Criteria Committee. The American College of Rheumatology 1990 criteria for the classification of fibromyalgia. Report of the multicenter criteria committee. Arthritis Rheum 1990 Feb;33(2):160-172. 22. Harden RN, Revivo G, Song S, Nampiaparampil D, Golden G, Kirincic M, et al. A critical analysis of the tender points in fibromyalgia. Pain Med 2007 Mar;8(2):147-156. 23. Wolfe F. The American College of Rheumatology preliminary diagnostic criteria for fibromyalgia and measurement of symptoms severity. Arthritis Care Res 2010 May;62(5):600 . 24. Goldenberg DL. Multidisciplinary modalities in the treatment of fibromyalgia. J Clin Psychiatry 2008;69(Suppl 2):30-34. 25. Burckhardt CS. Multidisciplinary approaches for management of fibromyalgia. Curr Pharm Des 2006;12(1):59-66. 26. Staud R. Treatment of fibromyalgia and its symptoms. Expert Opin Pharmacother 2007 Aug;8(11):1629-1642. 27. Sarzi-Puttini P, Buskila D, Carrabba M, Doria A, Atzeni F. Treatment strategy in fibromyalgia syndrome: where are we now? Semin Arthritis Rheum 2008 Jun;37(6):353-365. 28. Nijs J, Mannerkorpi K, Descheemaeker F, Van Houdenhove B. Primary care physical therapy in people with fibromyalgia: opportunities and boundaries within a monodisciplinary setting. Phys Ther 2010 Dec;90(12):1815-1822. Published online 16 Sep 2010. 29. Clauw DJ. Pharmacotherapy for patients with fibromyalgia. J Clin Psychiatry 2008;69(Suppl 2):25-29. 30. Häuser W, Thieme K, Turk DC. Guidelines on the management of fibromyalgia syndrome - a systematic review. Eur J Pain 2010 Jan;14(1):5-10. 31. Rooks DS. Fibromyalgia treatment update. Curr Opin Rheumatol 2007 Mar;19(2):111-117. 32. Culpepper L. Nonpharmacologic care of patients with fibromyalgia. J Clin Psychiatry 2010 Aug;71(8):e20. 33. Jones KD, Adams D, Winters-Stone K, Burckhardt CS. A comprehensive review of 46 exercise treatment studies in fibromyalgia (1988-2005). Health Qual Life Outcomes 2006;4:67. 34. Busch AJ, Schachter CL, Overend TJ, Peloso PM, Barber KA. Exercise for fibromyalgia: a systematic review. J Rheumatol 2008 Jun;35(6):1130-1144. 35. Wang C, Schmid CH, Rones R, Kalish R, Yinh J, Goldenberg DL, et al. A randomized trial of tai chi for fibromyalgia. N Engl J Med 2010 Aug;363(8):743-754. 36. Cao H, Liu J, Lewith GT. Traditional Chinese Medicine for treatment of fibromyalgia: a systematic review of randomized controlled trials. J Altern Complement Med 2010 Apr;16(4):397-409. 37. Callahan LF, Freburger JK, Mielenz TJ, Wiley-Exley EK. Medical skepticism and the use of complementary and alternative health care providers by patients followed by rheumatologists. J Clin Rheumatol 2008 Jun;14(3):143-147. 38. Porter NS, Jason LA, Boulton A, Bothne N, Coleman B. Alternative medical interventions used in the treatment and management of myalgic encephalomyelitis/chronic fatigue syndrome and fibromyalgia. J Altern Complement Med 2010 Mar;16(3):235-249. 39. Itoh K, Kitakoji H. Effects of acupuncture to treat fibromyalgia: a preliminary randomised controlled trial. Chin Med 2010;5:11.